There's something exciting about getting wrapped up warm and heading out after dark to enjoy some festive magic. I've put together a list of 11 places to visit after dark this year. Let me know if you have any to add to the list. Beamish will once again open their doors for this popular after hours event. Enjoy ice skating, mulled wine, Christmas decorations and entertainment, visiting Father Christmas in his fireside grotto, mulled wine, roast chestnuts and more..... Tickets always sell out so If you'd like to visit, I'd advise booking ASAP. Find out more and book here. 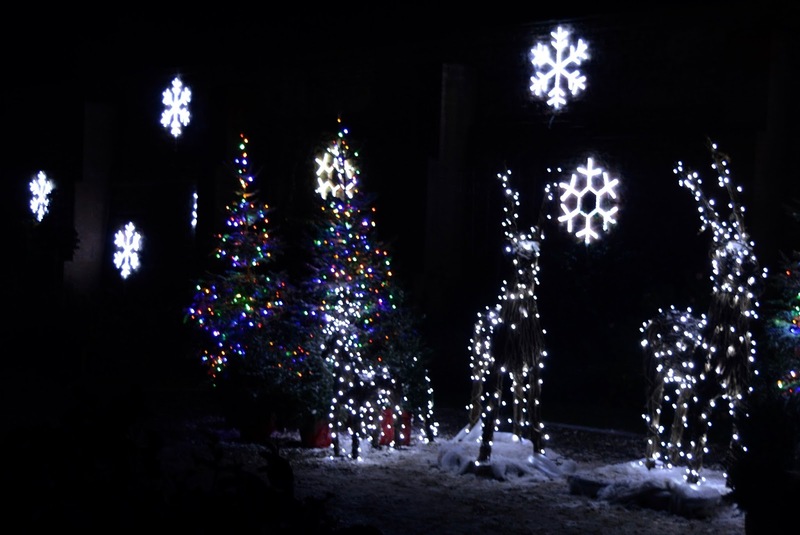 Follow the fairy lights through the garden trail and experience light, sound and colour in this special evening event. You'll find traditional fairground rides, mulled wine, mince pies and Christmas shopping opportunities too. Find out more and book here. It may be personal preference but I LOVE taking the kids to see Fenwick's window in the dark. We were there for the unveiling last year and absolutely loved it - the atmosphere was fantastic. I wonder what the theme will be for 2017?? Keep your eyes on the Fenwick Newcastle Facebook page for announcements. Our favourite after-school trip in December is a trip to the panto. We're spoilt for choice this year with new pantomimes at Times Square and Gateshead Stadium alongside traditional favourites. I'll be writing a guide to North East pantos soon so keep your eyes peeled! Visit Wallington after dark and see the house beautifully lit up and decorated for the festive season. Enjoy festive music in the hall, baking smells from the aga and Christmas shopping opportunities. You can book to meet Father Christmas too. Find out more here. This popular event by NewcastleGateshead Initiative and Gateshead Council returns for 2017 with the theme 'Inventors Ball'. Specially commissioned artists will transform Saltwell Park with incredible inventions, plants and creatures. Tickets go on sale 9am 4 October and usually sell out quickly so set your alarms if you'd like to visit. Find out more here. Newcastle's Christmas Light Switch On is always a popular event with street entertainment, music and lots of fun. Look out for a date announcement soon (normally the end of November). Join G4 at Trinity Church in Gosforth for their special concert. Expect to hear timeless classics such as Silent Night alongside up-tempo numbers. These concerts raise money for the charity 'Missing People'. Find out more and book here. Roker Park will be transformed into a festival of light with a Disney theme. The park will be open every Thursday-Sunday evening from 5-10pm (plus every night during half term). Expect sparkling fairies, pirates, an art zone, helter-skelter, music and entertainment. Tickets are £1 per person. Find out more and book here. Rockliffe Hall Spa are hosting a special Spa-ty in their stunning Spa Garden every Thursday evening throughout November & December. Enjoy a glass of mulled wine and mince pies as you relax in the spa to festive music under the night sky. Find out more and book here. Wrap up warm and head to Gibside's chapel for two special evenings of festive music. Mulled wine and mince pies will be served during the interval. Find out more and book here. Let me know if you have any evening events booked yet or if there are any from my list you fancy. I want to go to all of them, I'm such a big kid, honestly this year with Looby at home all of the time is going to be the best Christmas ever, we'll be indulging in everything!! Nothing like a nice Carols by candlelight service to get you in the mood! We're hoping to go to Belsay Hall this year too. I NEED to get us booked into at least one of these! We used to do Saltwell Park every year as we were walking distance but don't bother any more so we need something as a replacement!